President Donald Trump released his administration’s “skinny budget” for Fiscal Year 2018 on March 16, proposing increases for military spending and cuts to many other programs, including those at DOT. APTA Acting President & CEO Richard White said the association is disappointed that the budget proposals were announced at the same time the administration is calling for a $1 trillion infrastructure investment. Although Congress will take this proposal under advisement, the House and Senate will ultimately develop their own FY 2018 budget and spending bills to be signed into law. This week APTA held its 42nd annual Legislative Conference in Washington, DC. Participants from across the nation gathered to hear from FTA Executive Director Matt Welbes, Washington insiders, members of Congress, congressional committee staffers, local development experts and representatives of surface transportation coalition partners. Read more in the March 27 Passenger Transport. Coming soon: the APTA Bus & Paratransit Conference, May 7-10, Reno, NV, and the APTA Rail Conference, June 11-14, Baltimore. These are two opportunities for public transit professionals to learn from experts, network with their peers and discover the newest and most innovative products and services. For more information or to register, click here. 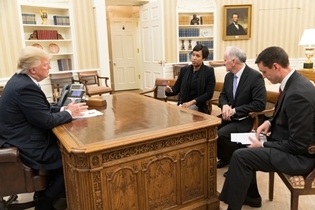 Conference Makes News: The Washington Post reported on comments by WMATA General Manager Paul Wiedefeld and other public transit CEOs from the news conference held during the APTA Legislative Conference. Transit as ‘Moon Shot’: Money magazine advises President Trump to make public transit his “moon shot,” citing new APTA research that finds 87 percent of all trips are related to the economy. Quality Counts: Riders’ exposure to high-quality public transit in their 20s and 30s increases the likelihood they’ll continue using it even if they move to locations offering less or reduced service. Humor Works: Watch this 60-second video from Halifax Transit letting riders know about the agency’s new bus-tracking service.